Faithful Families provides nutrition and healthy living education in faith communities, with a curriculum designed to tie together faith and health. The nine-part curriculum is taught by a trained nutritional facilitator and a lay leader from the faith community. The model has inspired similar faith-based prevention initiatives in at least seven other U.S. states. The program has demonstrated clear potential for inspiration, having been replicated several times outside of North Carolina. The curriculum inspired the New Jersey Department of Health’s Faith in Prevention program in Camden, New Jersey, and was used for similar programs in Florida, Arkansas, South Carolina, Illinois, and Tennessee. Faithful Families Eating Smart and Moving More is a healthy living curriculum taught to a faith community by a trained nutritional facilitator along with a lay leader from the faith community. The curriculum features nine lessons on topics like “Shop for Value, Check the Facts” and “Choosing to Move More Throughout the Day.” The elements of the curriculum are then tied to religious teachings of the faith community in which the program is taking place. Faithful Families thus aims to tie together values of religion and health for individuals, families, and communities. The curriculum “kit” costs $150, and there are over 100 trained facilitators throughout the state of North Carolina, listed on the Faithful Families website by county. The program has demonstrated clear potential for inspiration, having been replicated several times outside of North Carolina. The curriculum inspired the New Jersey Department of Health’s Faith in Prevention program in Camden, New Jersey, and was used for similar programs in Florida, Arkansas, South Carolina, Illinois, and Tennessee. Faithful Families is an impressive example of a prevention effort that goes to meet people where they already are: their established faith communities. While school-based programs, for example, can be logical tools for reaching children, it can be difficult to find spaces in which to regularly make contact with all generations. Faith-based communities present an opportunity to do exactly that in a setting where people are already deeply engaged. Through this format, Faithful Families might avoid some of the retention challenges faced by many lifestyle-change programs. Additionally, by connecting healthy living principles to already embraced religious values, Faithful Families has devised a way to help make lifestyle changes more permanent, even after the program ends. 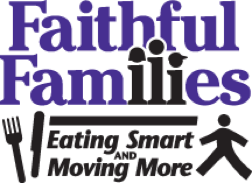 Faithful Families, “About Us,” Eat Smart, Move More NC, n.d., http://www.faithfulfamiliesesmm.org/about.html. “Faith in Prevention,” Camden Coalition of Healthcare Providers, 2016, https://www.camdenhealth.org/faithinprevention/.